Billboard-charting guitarist Sean Kelly is a native of North Bay, Ontario. under renowned instructor Eli Kassner at the University of Toronto. 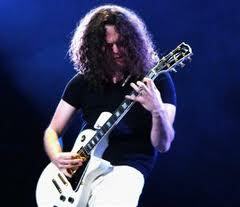 At the same time he started to seek his fame and fortune as a rock guitarist. After playing in several local bands, he formed his own band, Crash Kelly, in which he both sang and played lead guitar. The band has released three albums via Century Media, the world’s largest independent heavy metal label, and toured with hard rock legend Alice Cooper. Sean also currently tours as lead guitarist for Grammy Award–winning superstar Nelly Furtado and has performed with and written a number of songs for many multi-platinum acts, including Helix, Carole Pope, and Rough Trade, as well as former Guns N’ Roses member Gilby Clarke, former Guess Who vocalist Carl Dixon, and many other notable stars. In the last few years, he has recorded three classical guitar albums that have won great acclaim and reached the classical music bestseller charts.